Made from Premium Pine Wood (frame) and Beech Wood (Legs), Solid to Last You a Lifetime. Superior Cotton and Linen blended Cover is luxurious and comfortable. Full Assembled, Ready to Use; Two Colors are Available. Prop up your feet, provide extra seating or set a tray across the top to use as the perfect centerpiece to any sitting room area. There’s nothing quite like being able to kick your feet up on this ottoman and lounge in your living room with a blanket thumbing through the pages of a book and cup of warm tea after a long day of work. Also, elevating your feet takes the stress off your back and relieves the body. 1Easylife elegant padded foot stool provides you with the perfect blend of comfort and luxury. You and your feet will love more and more each day. 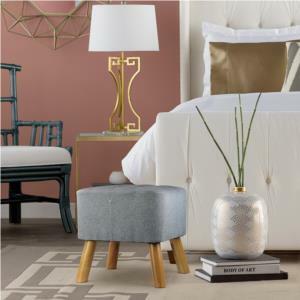 With its simple, handcrafted and attractively look, this upholstered foot stool, along with its practical uses, makes a great addition to any living room, family room, or home office as room décor. ★ Linen cover is easy to remove and washable if got some dirty marks. ★ The natural Paulownia wood frame adds stability and will last you a lifetime. ★ Four beech legs are not only looking good but also solid and will not scratch your floor since four anti-slip foot pads are equipped. 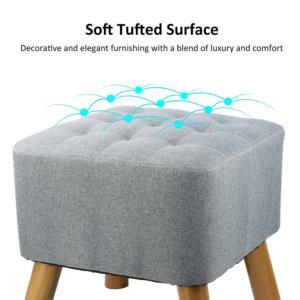 ★ The sponge padded top makes it a comfortable extra seat, stylish cocktail table, ottoman and elegant footrest stool. 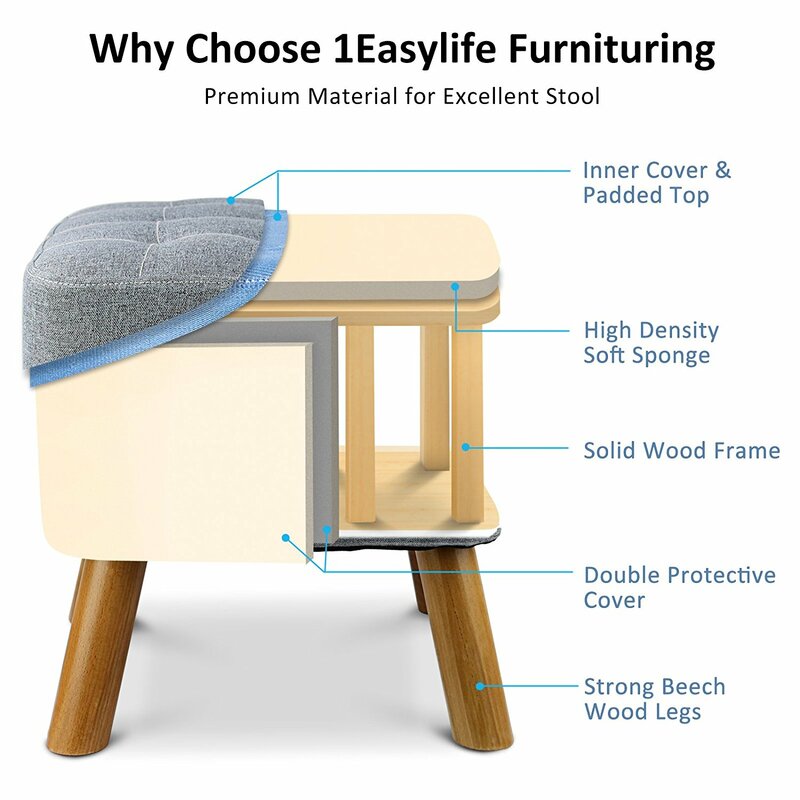 ★ Ergonomics design, 33cm in high & 45 cm in long & 40 cm in wide, 101 degree tilt between the feet and ground, which can make the stool very stable on uneven floors. Are the legs removable? I need an 8" high padded stool. 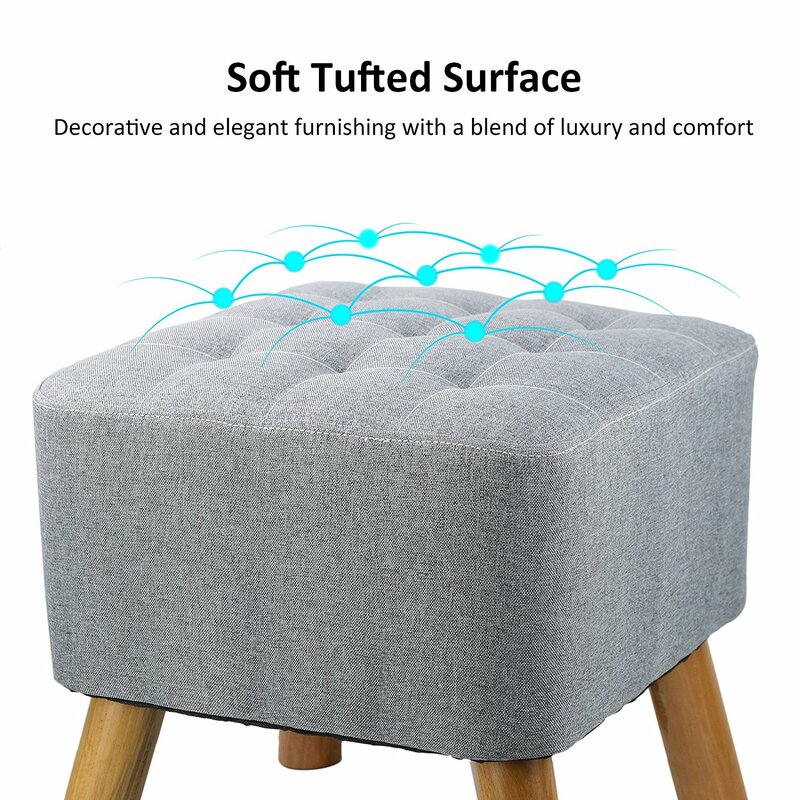 Can you purchase a replacement cover for the foot stool? Sorry currently replacement cover is not available, but the cover comes off and is washable. If you want other type of cover, maybe you can try to find a shop which sells covers for furniture. Do you like the color as shown in the listing picture? or you prefer other colors? Would these work well for kids to sit on at the library? They would be perfect for children over three. They're a little "tippy" for toddlers. Is there any other colors this comes in other than grey or tartan? So sorry currently we only have 2 colors for choice. This is one of our new product, we value your opinion and will consider about it. May I know which color or design you like? Hi, what other colors are available now for this item and when will you have it again in the Tartan Plaid pattern please... thank you. You mean you like Tartan Plaid pattern? So sorry this color is not available. We just have flax grey now, no other color is available currently. We may offer more color choices in future, but not soon. Great with a minor modification! I ordered these for our garage, we turned it into a game/living room. 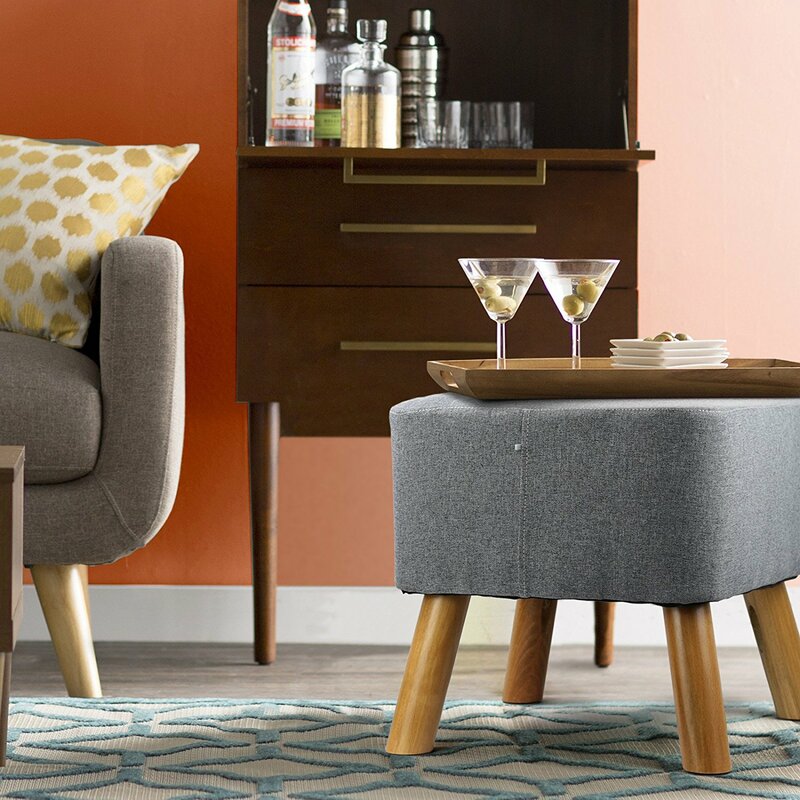 All we needed for our futons were some stools to make our seating area more comfortable. When I first saw all of the reviews for these I was excited, the only thing that didn't really convince me were the colors. They don't match our room at all. I decided to order them anyway and deal with that problem once they arrived.They got here in 2 days (I have Amazon prime) and they were all in one big box, packaged individually inside. Once I opened them, I noticed some spider webs or mossy things on the bottom. I have added photos for your review. I unwrapped them, took the removable fabric off and cleaned them off with a brush. Once I cleaned them, I decided I would paint the legs black, I put the removable fabric to wash and I started sanding the legs to get a better finish. I have included pictures of the process and the finished product as well.I love them! They are very sturdy and exactly what we needed! They are very affordable and they also look very elegant. I definitely recommend these!The only negative was the bottom being moldy. 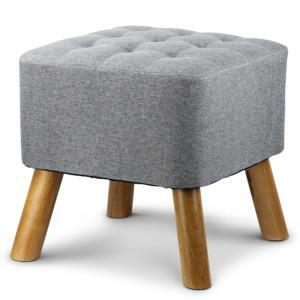 Very cute stool! It's a bit small for sitting on, but is perfect to go with my rocking chair. 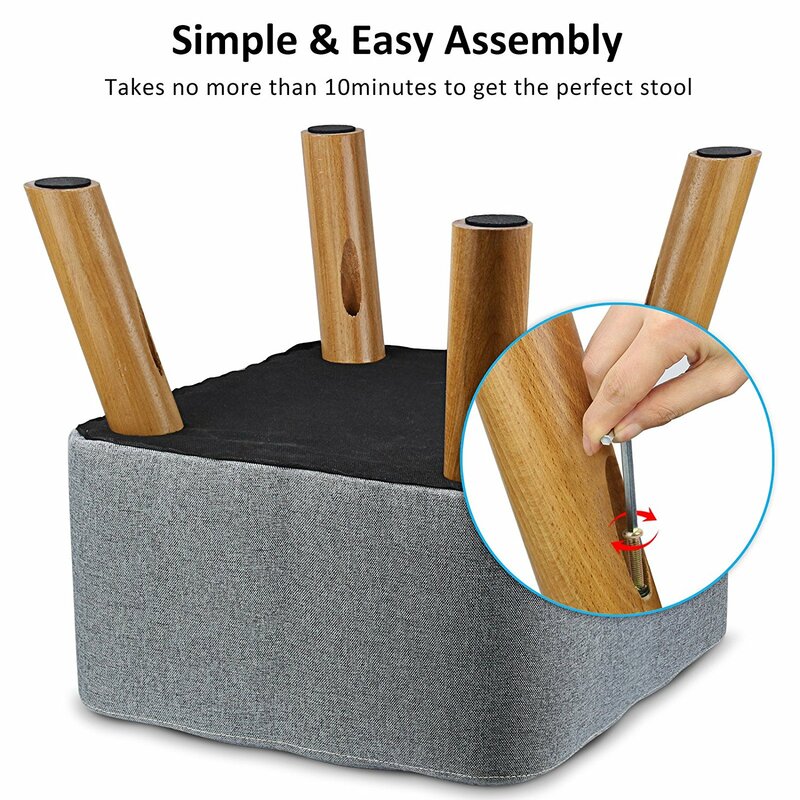 Super fast shipping and the stool is very sturdy! I hope this review is helpful! Also, the legs are wooden, and not the metallic shade that can appear in the picture. We LOVE this little toadstool. We use it for story time with our kid and our kid sits on it for crafting and tea parties with her dollies. Great colors. Would love to order another one. A little hesitant, as it did arrive with the yellow mold on the bottom, as other reviews have noted. I cleaned it and left it out in the sun. There's no smell, but odd looking mold is concerning. **Edited after new stool was provided**The seller promptly replaced the damaged stool that we initially received with an undamaged stool. The stool is a nice size and is comfortable used as a footstool with the rocker in our nursery. The fabric appears to be durable and the removable cover is a nice feature for keeping things clean.Previous Review: Straight from the box and covered in mold from evident water damage. This was for our nursery. Disgusting. 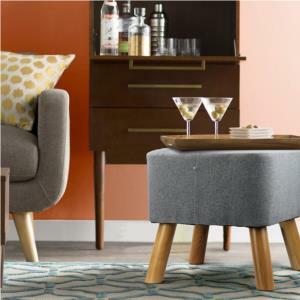 Love these little stools! We don't have room for a kids table in our tiny house so we have these under our coffee table for our toddler to use when he is doing crafts or having a snack. These seem very durable and I love that the cover comes off for washing! 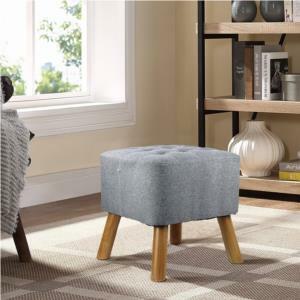 I love the look of this foot stool. Quality is good and looks well made. 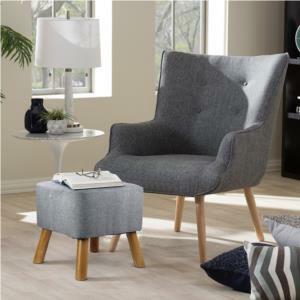 However, I intended to use it with my rocking chair and it is too lightweight, so the stool kept tipping over.I'm returning it for that reason, but if I were to use it with a stationary chair, it would be just fine. Perfect size for underneath my desk at work. I love it and use it all the time.Material is not the best, but I like that I can take it off and home to wash, so I don't care since it's just my feet laying on it.